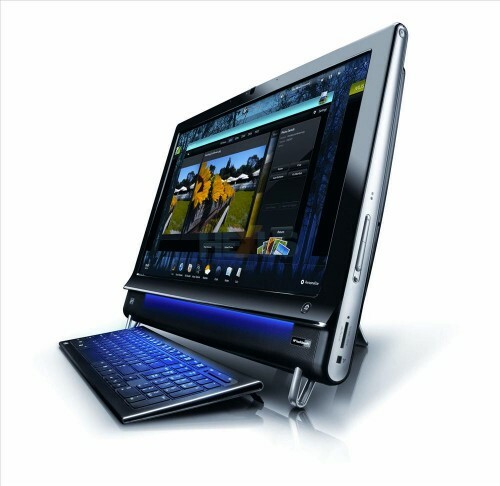 It’s time to conclude our review of the HP Touchsmart 600-1055 and to bring our giveaway to a close. For those of you who didn’t follow, the previous article is here. We decided to combine parts 2 and 3 into one, simply because the initial article contained all the info you needed on the machine’s hardware, leaving us with only with the Touchsmart Suite of applications to review. If you’ll recall, we’re trying to determine if this all-in-one can serve as an entertainment hub and replace your TV, your DVD/Blu-Ray player and your CD/Stereo. So, keep reading to find out in some detail just how it does. The early verdict? Works as advertised, but nagging software inconsistencies mar an otherwise excellent product. [We’d like you] to see if the TouchSmart PC is deserving of being called an “Entertainment Hub.” In addition to serving as a touch-enabled desktop PC, the TouchSmart can stand in place of several entertainment devices like a DVD player, TV, Blu-Ray Player, etc. It also has an HD widescreen display, TV Tuner, game console connectivity and several new built-for-touch applications from Hulu, Netflix, Pandora, Rhapsody and more. In order to do this, we’re going to split up this review into three pieces. Today, we look at the Touchsmart 600 being used as a TV/PVR, in Part 2 as a DVD/BluRay player and Part 3 as a CD/Digital Music Player/Stereo player. Don’t feel like reading or watching my video? No problem, here’s the verdict: as a TV to play Xbox in HD on, without HDMI? Not so much. As a TV and a PVR? Absolutely. Read on for all the details and to find out how to win your own!